Pound-for-pound, arguably the best athlete in all of sports. He has to balance his weight on his toes, that are pressed tightly into a thin metal stirrup, while guiding an animal weighing more than 1,000 pounds around a race track, at nearly 40 miles per hour. During the course of a race, only the insides of his feet and ankles are in constant contact with the horse. He is effectively floating in midair, while holding a rein that acts as his steering wheel. But, unlike a steering wheel, it’s not attached to a chassis. If the horse stumbles, or the jockey starts to lose his balance, there is nothing firm for the jockey to hold onto. A racehorse’s neck tends to be slippery, and in perpetual motion. And if he falls, his life can change in an instant. In April 2013, Johnny Velasquez, one of the best jockeys in North America, was considering his options for the Kentucky Derby. He had been the rider for two horses pointed toward the Derby, both considered top contenders, and he had not decided which one to ride in the Derby. But that all changed in a race at Aqueduct racetrack when he was thrown hard to the ground and taken off the course on a stretcher. He said later that it felt like “a car hit” him. He fractured a rib and chipped a bone in his wrist. Suddenly his plans for the Derby were seriously in doubt. While the top jockeys in horse racing do receive compensation on a par with athletes in other sports, their numbers are few. Using last year’s information from Bloodhorse Magazine, the top 5 money earning Jockeys (in terms of purses won) account for 16% of the earnings for the top 100 jockeys. Jockeys do receive a share of purse money, usually from 5% to 10%, if their horse finishes in 1st, 2nd, or 3rd place. If not, their compensation on a per race basis is a mount fee that is typically less than $100. Not much for someone risking their life and livelihood each time they get on a horse. The following is a list of attributes that I feel distinguish the top jockeys in the sport. Quick Reflexes. The ability to spot an opportunity in a split second; to send their horse through a brief opening, avoid a spill, or guide their horse around a tiring frontrunner. Astute Planner. Understands the peculiarities of his horse, as well as the tendencies of the other horses and jockeys. Knows how the track is running, whether there are advantages to be on the rail, on the lead, or sitting patiently behind a speed duel. Alert. Knows how to keep his horse ready for the start, while in the gate. Is fully aware of the developing pace of a race, and how he might have to adapt his strategy. Anticipates what other horses are doing during the course of a race and reacts accordingly. Unflinchingly Courageous. Despite prior spills, broken bones, and months of rehabilitation, the nerve to resume riding and concentrate on the task at hand. To guide his horse through a maze of traffic, punch through a narrow opening, find some daylight, and finish with a flourish at the end. Johnny Velasquez made it back to ride in the 2013 Kentucky Derby. 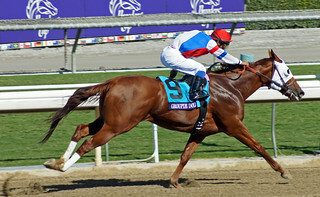 However, later in the year, at the Breeders’ Cup, he was seriously injured in a spill at Santa Anita racetrack. After bleeding internally, Johnny underwent emergency surgery to remove his spleen. Once again he recovered, returning to ride nearly three months later … this time with a scar that runs down the middle of his chest to below his belly button. I think this is great and pretty spot on Neal! The one thing I would add to this and not many people think about, is the resilience a jockey has to have. Typically a 90% losing rate for the average jockey, always unhappy owners, trainers and fans who are critical to every move during the course of the race. 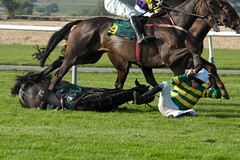 Often the jockey takes quite a bit of blame for the losses. So with that said, all the qualities you mention above, the emotional bumps and bruises are usually some of the hardest to handle, so resilience is so important for a jockey at any level to roll with the brutal emotional punches bound to be thrown! 🙂 Great job as always Neal!